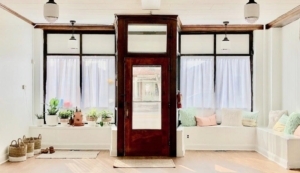 Nestled in the Village of Fairport, Charisma Yoga Bar offers daily yoga classes in a variety of styles, led by instructors from diverse training backgrounds. We realize that students come to the mat from all walks of life, with varying levels of experience. No matter where you are on your journey, we are excited to support you. When you walk into Charisma Yoga Bar, you’ll find a warm, loving space where you can learn, play, and grow. We aim to create an environment that is non-intimidating, non-judgmental, safe, and welcoming to all. We believe in Down Dogs and dance parties, In green juice and doughnuts, In stillness and in speaking out, and most of all, in you. We’re serious about what we do, but we try not to take life too seriously.